Explore how you can use the energy of your consciousness to heal your body and mind and release you from health-destroying patterns. This program includes groundbreaking research, interactive exercises, powerful meditations, energetic transmissions, and an evening keynote by Joe Dispenza. Liberate your potential and change your biochemistry through mind-body medicine, epigenetics, neuroscience, and biomechanics. Cutting-edge techniques at the frontier of healing arts today. Experiment with practices that can help you slow down aging, address disease, and program yourself for long-term health, inner peace, and vitality. Special Pricing Combine this program with Joe Dispenza’s Progressive Workshop: Ascending Your Energy, Tune into Your New Destiny, October 20–22, and receive a 10 percent tuition discount on this program. Additional night stay is required; call to register. 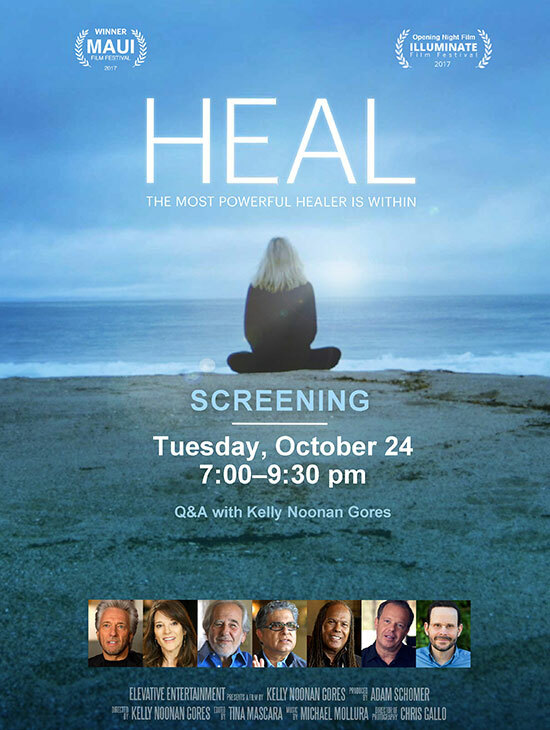 Join Director Kelly Noonan Gores for a screening and Q&A of her film HEAL. HEAL takes us on a scientific and spiritual journey where we discover that by changing one’s thoughts, emotions, and perceptions, the human body can heal itself from any dis-ease. HEAL not only taps into the brilliant mind’s of leading scientists and teachers like Dr. Deepak Chopra, Dr. Joe Dispenza, Anita Moorjani, Bruce Lipton (and many more), but follows real people on actual high-stakes healing journeys. Tickets: $20; free to in-house guests. Joe Dispenza, DC, one of the scientists featured in the film What the BLEEP Do We Know! ?, is a teacher, lecturer, researcher, and New York Times best-selling author. Dawson Church, PhD, author of The Genie in Your Genes, founded the National Institute for Integrative Healthcare and trains thousands each year through EFTUniverse.com. Shamini Jain, PhD, is a scientist, psychologist, social entrepreneur, founder of the Consciousness and Healing Initiative, and assistant professor at the University of California, San Diego. Charan Surdhar is an epigeneticist working to help people with genetic diseases release the emotions, beliefs, and perceptions that block positive gene expression. Eileen Day McKusick, MA, is a pioneer researcher and international thought leader in the fields of therapeutic sound and the human biofield. Kelly Noonan Gores, a Los Angeles native, started Elevative Entertainment in 2012 with the intention of creating conscious media that informs, inspires, and empowers.